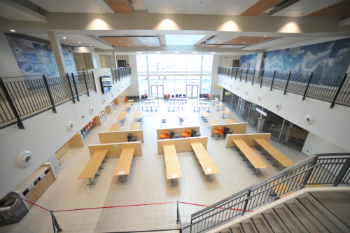 The cafeteria is a bright and airy space conveniently located off the Adult Atrium on the S1 level. It is easily accessible to staff, patients and visitors. During the warmer months of the year, a terrace right off the cafeteria will be open for patients and staff to enjoy. Vending machines will be primarily located on S1 in Blocks B and C near the Emergency Departments. The green space at the Glen site amounts to approximately 35% of the total size of the site. This includes a park, a playground for children, a Zen garden and several walking paths. All green spaces encourage relaxation and support the healing process. The Glen site has often been described as a village with streets and plazas. The Galleria is the Glen site’s main street that spans the rez-de-chausée level of the hospital complex and looks onto the public plaza facing the Vendôme metro station. It is filled with natural light and populated by cafés and restaurants where people can take a break. 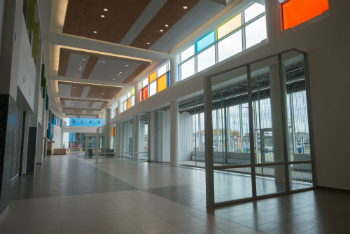 The Larry & Cookie Rossy Promenade is the primary point to connect to the hospital blocks and get to the elevators, care units and clinics. There is also a clear network of interior streets that facilitate wayfinding and provide calm spaces for staff, students, patients and their families. There are three atria throughout the hospital complex: Atrium AB-Pediatric, Atrium CD-Adults and Atrium E-Research Institute. The hospital complex has over 20 commercial retailers in high traffic areas at the Glen site. The types of services you can expect to find include: coffee shops, restaurants, gift shops, a florist, dry cleaner, and a pharmacy, to name a few. The retail units are primarily spread throughout the Larry & Cookie Rossy Promenade, and along the atria on the S1 level (Atrium AB-Pediatric, Atrium CD-Adults and Atrium E-Research Institute). There are banking machines (ATMs) on the S1 level of Block A, and on the rez-de-chausée level in Blocks C and D.
This 1,000-square-foot space includes a business centre with Wi-Fi access, a library and a closed family conference room for support group meetings and workshops. 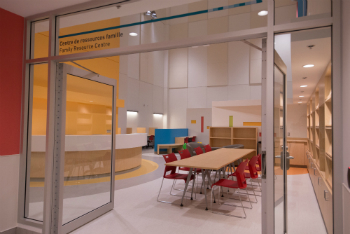 The MCH Family Resource Centre is located on the rez-dechausée level of Block A, room 1107 (A RC.1107). Sociocultural Consultation and Interpretation Services (SCIS) at the Glen site for the MCH maintain their role in facilitating communications between patients and staff in 40 languages through interpreters. They are also available to mediate complex issues arising from diverse cultural and social realities. To request the services of the SCIS at the Glen site for the MCH, during regular hours from 8:30 a.m. – 4:30 p.m. Monday to Friday, please call extension 22351. On weekdays after 4:30 p.m. and on week-ends, please call 24499 or page 406-1555. An example of a sophisticated new addition at the Glen site is the Medical Records Viewing station. A significant step towards patient empowerment, this space provides a dedicated area with private rooms for patients to view their medical records. This is done in accordance with laws that govern access to health information in Quebec. The rear of the department is reserved for staff administrative spaces where patients can go for assistance or inquiries. The Medical Records Viewing is located in the Larry & Cookie Rossy Promenade on the rez-de-chaussée level, adjacent to the Block C main entrance (C RC.0024). A Prayer and Meditation room is available to provide a welcoming space for healing and contemplation for people of all faiths or none. It is open 24 hours a day and located in Block A, level 2, room 0045 (A 02.0045). Montreal Children's Hospital: Spiritual Care Professionals can be reached 24/7 through locating by asking for the pediatric Spiritual Care Professional on-call. The administrative office can be reached during the day from 8:00 a.m. to 4:00 p.m. at extension 23109.